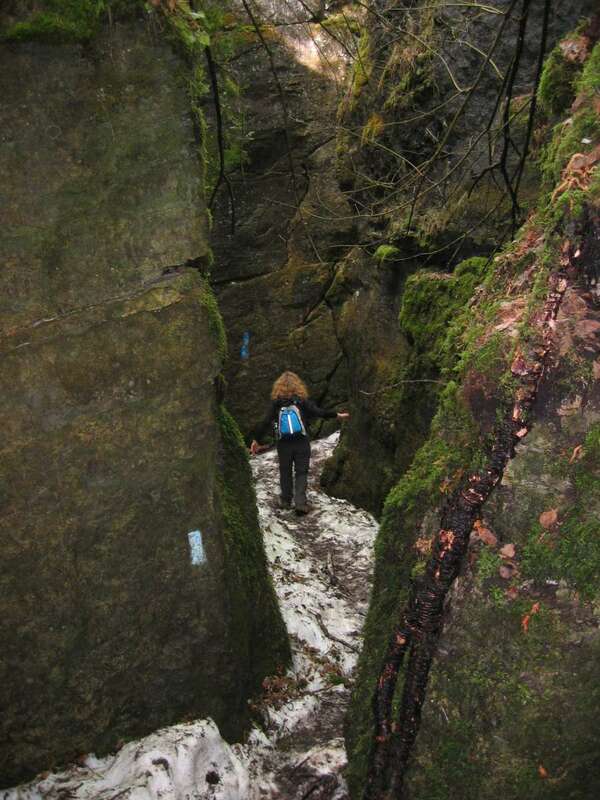 In the caves trail itself, we will also be walking on snow and ice. Please, no open toed shoes. No running shoes with worn tread. Sturdy hiking boots or shoes, ankle support, with good treads are strongly recommended. Hikers with inadequate footwear may not be allowed to entered the caves portion of the trail. The pickup at Yonge and York Mills will be at 9:00am! The parking lot at the trailhead is small, so we appreciate car pooling more than usual. Google Maps directions may or may not agree with the above. We will start at the Bruce Trail club's parking lot on County Road 91, just west of Duntroon. From there we will hike from BTC km 29 to the Singhampton Caves at BTC km 35.4, returning on the same route. On the way back to the cars we will explore the new Franks Lime Kiln side trail, a feature recently restored and opened to the public. After, we can do dinner at Mylar & Loreta's in Singhampton. We know a bunch of you are looking forward to this. Total hike distance (to be confirmed) is about 12km.